The joint Shaolin-Muay Thai event I wrote about two weeks ago went down on July 18th. Saenchai and Sudaskorn were among the Thais who fought—against Westerners and Russians, not Chinese—with Chinese Muay Thai and Sanda fighters also fighting Westerners. It was a KO-fest, with most of the Thai’s opponents going down in the first round. The fights don’t look staged, but neither do they look like hotly contested bouts. 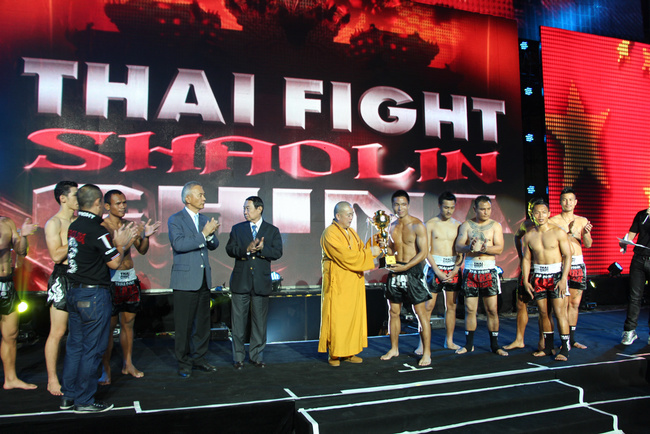 This was a promotional event, jointly organized by the Shaolin Temple, the Thai-China Industrial Promotion Association led by General Chetta Thanajaro, and the Beijing Zhenghao Cultural Media Company to bring Muay Thai to China and to establish a working relationship with the Shaolin Temple. To get a taste of the fights, check out the unofficial KO of the Night at at 5:34 of this video. Don’t blink. A local Zhengzhou gym, run by Wang Xuezhong, provided most of the Chinese Muay Thai fighters. The idea right now is for his gym to be the center of an emerging Chinese Muay Thai scene, with Thai trainers coming in to help bring along the Chinese, and perhaps competing in events like the one just held. There are a lot of Chinese Muay Thai fighters and Wang’s gym will most likely be the center of the Shaolin-Thai relationship, for now. Shaolin Abbot Shi Yongxin attended the event, lending considerable credibility to the China-Thai martial arts relationship. This is rumored to be the first time a Shaolin Abbot has attended a non-Shaolin martial arts event, which speaks to the respect the Chinese have for Muay Thai. Unfortunately, the abbot is also dealing with some very recent corruption allegations spreading through China’s Weibo social media platform. A “Shaolin insider” who calls himself Shi Zhengyi (which means “interpreting justice” in Chinese) has leaked photos of women and children whom he calls “the mistresses and illegitimate children of Abbot Shi Yongxin.” Nothing has happened yet, and the abbot is brushing the allegations off. But with China’s leader Xi Jinping cracking down on corruption as much as anyone can in China, now is not the time for damaging pictures to surface. Until these allegations resolve themselves, it’s business as usual for the temple: Expand the Shaolin brand internationally and domestically with big events, fireworks, and solid partnerships with powerful people.